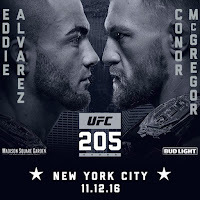 UFC 205 Conor McGregor vs Eddie Alvarez Fight Pick & Preview | MMA Fighting Events Videos Techniques UFC Fight Picks and News. 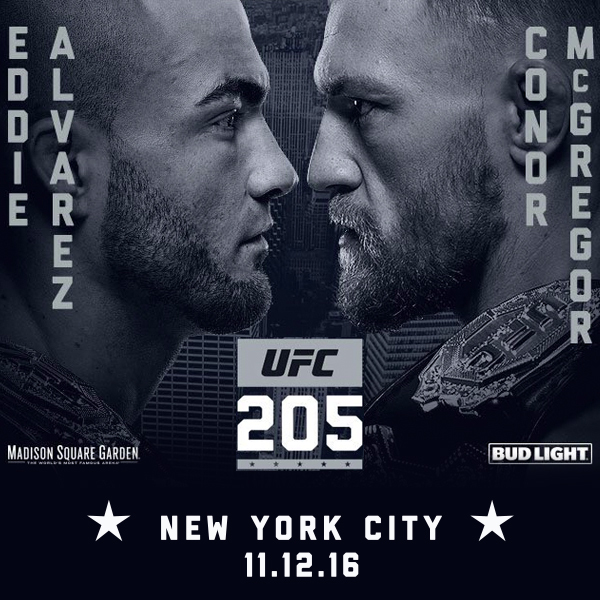 UFC 205 has to be one of the best fight cards this year and it’s being headlined by a great fight. For the first time in UFC history, two champions from different weight classes will face each other. Conor McGregor vs Eddie Alvarez is going to be a chingasosfest! Let’s take a closer look at each fighter and then I’ll make the official Chingasos MMA fight pick for Conor McGregor vs Eddie Alvarez. Conor McGregor is coming into this title fight with an overall record of 23-3. Keep in mind two of those loses where early in his career. He rattled off victory after victory until he stepped up two weight classes to 170 lbs to fight Nate Diaz. As we all know, he’s avenged that loss at that higher weight class. Now he’s coming back down a weight class to challenge for the 155 lbs title. Conor McGregor showed finishing KO power in the 145 lbs division. 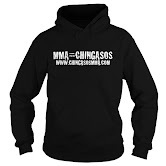 He finished 17 of his 19 wins via KO/TKO. He couldn’t KO/TKO Nate Diaz at 170 lbs, but Diaz has one of the best chins in MMA, and at times, in both fights, it looked like he would. McGregor’s takedown defense is solid. Chad Mendez was able to take him down but then couldn’t do much with it. Once McGregor made it back to his feet, he finished off Mendez with relative ease. Now he’s facing Eddie Alvarez who is heavier than Mendez, is a better striker, and, has shown a great chin. Eddie Alvarez has been a professional MMA fighter since 2003. He’s racked up a record of 28-4 but has only had 4 fights in the UFC. He’s only had 4 fights in the UFC but in that time he’s fought the best of the best. He lost his first fight in the UFC to Donald Cerrone but has since then racked up three wins in a row agains the best in the division including the title fight with then champion Rafael Dos Anjos. Eddie Alvarez has a strong wrestling base but he can also finish fights with his striking ability. He has 15 KO/TKO’s on his resume. While most of his fights in the UFC have gone to a decision, he does have 7 submissions outside of the UFC. Alvarez has a solid chin, he’s only been finished once via TKO and that was way back in 2007. Eddie Alvarez has flown under the radar but make no mistake about it, he is going to be one of the biggest challenges yet for Conor McGregor. With that being said, Conor McGregor gets in the head of fighters, and it already looks like he’s won that battle. Look for Alvarez to make mental mistakes in this fight which McGregor will capitalize on. These fighters can both hit hard and, they will be head hunting. This fight won’t go past the 4th round. Conor McGregor will get the better of the exchanges. Alvarez will look for takedowns but McGregor will stuff them. The fatigue from those takedown attempts will add up and McGregor will begin to land more and more chingasos. One of those chingasos will eventually be the undoing of Alvarez and McGregor will make UFC history by holding titles in two different weight classes.